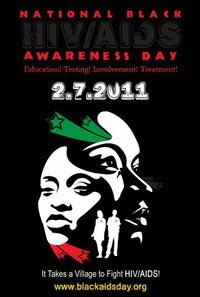 National Black HIV/AIDS Awareness Day, February 7th of every year, is a national HIV testing and treatment community mobilization initiative targeted at Blacks in the United States and the Diaspora. There are four specific focal points: education, testing, involvement, and treatment. Educationally, the focus is to get Blacks educated about the basics of HIV/AIDS in their local communities. Testing is at the core of this initiative, as it is hoped that Blacks will mark February 7th of every year as their annual or bi-annual day to get tested for HIV. This is vital for those who are sexually active and those at high risk of contracting HIV. When it comes to community and organization leadership, getting Blacks involved to serve is another key focus. We need Black People from all walks of life, economic classes, literacy levels, shades and tones as well as communities (large and small) to get connected to the work happening on the ground in their local areas. And lastly, for those living with HIV or newly testing positive for the virus, getting them connected to treatment and care services becomes paramount.